I have been writing on tithe and this is a continuation of the subject. In order to better understand this article you need to read the others. So go read the others if you haven't read it yet. We speak of how to tithe in the News Covenant and we mentioned that your wealth or money is one out of the many ways you can tithe. And tithing through wealth is not giving God a tenth of your wealth but giving Him all. This article is meant to answer the question, how can we give all our wealth to God as tithe? Tithing through wealth in the New Covenant is living a life where all your wealth is given to God; it is living a life of utter poverty. Tithe in the New Covenant is offering the fruit of Life onto God. We've put forward that Christ the Life and the fruit of this Life is righteousness, meekness, love, wisdom, health, power, wealth or riches, blessing etc. "saying with a loud voice: “Worthy is the Lamb who was slain To receive power and riches and wisdom, And strength and honor and glory and blessing!” (Rev 5:12). Christ is the Lamb and the New Covenant people are the body of the Lamb that have received this Life. Tithe is therefore offering this life to God. Wealth is one of the fruit of the Life. 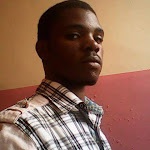 But we've gone beyond shadows and types and we don't do representative anymore, we can't offer a tenth, for this is not how God deals with the New Covenant people. We must offer all our wealth and riches to God - we must own nothing. "Then He lifted up His eyes toward His disciples, and said: “Blessed are you poor, For yours is the kingdom of God." (Luk 6:20). We are the people of the kingdom, the kingdom is ours and we are the poor. We are the blessed that are poor, for all We own belongs to God. We have given our lives to Him and He owns us and everything belonging to us. Tithing is giving God that which is rightfully His. We give God all that we own, all our money and live in utter dependence on Him; we rely on Him for everything. I am not saying we should give all our money to a pastor or a Christian organization even if it is called a church. We must give God Himself, our pastor is not God and no Christian organization is God. God lives in us, give God all you have. What does this mean? It means that your money and property is no longer yours, you can't do with it whatever you please. It is not you that decides how to spend it or how to get it. You are reduce to a mere steward of your money, God decides on what to do with your money and you have no right to resist Him. If He ask you to give a ridiculous large amount of your wealth to certain 'so-and-so', you have no choice but to do it. And if you want to give out money but God refuse you must yield to Him. It is not your money, the owner of the money can do with it however He please and you just have to obey. Ye, you may have large amount of money stored up in the bank but you are poor and you must depend on God for everything. Let God take care of you, let Him decide on how you should spend your money; on yourself and on others. Let Christ be Lord over your money. 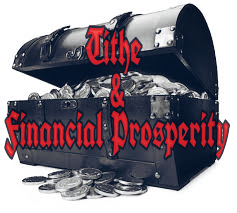 Financial prosperity comes in when the multiplying effect of tithe is implemented in our tithing by wealth. God always multiplies the tithe if offered, it is a divine rule. When we offer the fruit of the Life (as it expresses itself in wealth) then we would have multiplus of that fruit which is an increasing wealth, hence leading to prosperity. The idea that only ten percent of our income belongs to God is not Christ, it is unchristian to think that way. That mentality that all you have to do is give a tenth to God and you can do whatever you like with the rest is unholy. No God is your Lord, He owns you and all that you have. How dear you reduce God to just a tenth... a tenth! This is not honoring God, it is a disrespect to His Lordship. God must have all and Christ must reign over all; he must be Lord over all your money, your expenses and your revenue. The Christian life is a life utterly onto God, not partial and not a tenth. For all belongs to God.